So I just started reading the classic book How to Stop Worrying and Start Living by Dale Carnegie and it immediately gave me an insight that will possible change my life forever. And I’m thinking it could have the same positive impact on yours as well. The idea isn’t originally from Dale Carnegie but from one of the people he was in contact with. A medical student named Sir William Osler who back in 1871 was on the brink of a nervous breakdown from stress and anxiety caused by the worry of him not passing the exams. And apparently it worked pretty well! Because not only did Osler beat worry and passed his exams – he later went on to become Regius Professor of Medicine at Oxford (which apparently is the highest honor) and was even knighted by the King of England! And this was back in the day when being knighted by a king was a thing. Pretty well done by someone who was close to not even begin his real career. So, what is this magical idea? 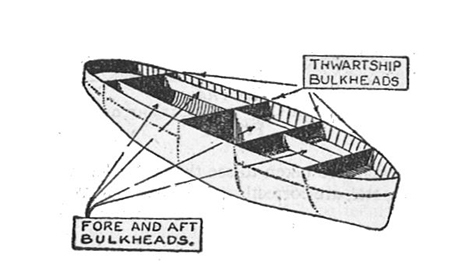 Live in “day-tight compartments” – an analogy from the world of ocean liners where the captain (if there is a leak) will just press a button and big, heavy iron doors will close of sections of the ship called bulkheads – creating watertight compartments – and as long as they are all shut the ship is very hard to sink. Can you sense the metaphor? You close your mental “bulkheads” between the past and the future, in order to give you peace of mind to focus on today alone. And it may not sound like much to the world but I have tried this way of thinking for a few days now, shutting the “bulkheads” between the past and the future with big, heavy mental iron doors, leaving me with only today in mind. And so far it is a game changer. Because what usually happens is that there is a lot of energy spent in between the doing. A worry about all the what-ifs and all the possible outcomes of all your past and potential actions. And that is a lot to keep in mind. And while you are not consciously doing exactly that, your subconscious mind is wired in such a way that it is constantly looking for ways to sink your ship. So that it can prevent them from happening. But at the same time not very productive because this process of analyzing every possible outcome of every possible action takes a lot of brainpower. It’s like you have this subroutine of your brain constantly trying to calculate infinity while the conscious you are just trying to focus on your thing. If you could only gain control of that brainpower and use it to make the most out of every day your future will be the best possible one. Because you are operating at your best. Because you are not wasting your mental energy on predicting the future. But on shaping it and building it instead. So, how do you turn it off? You turn it off by convincing your brain that shutting it off is a good idea which of course is the problem because those subroutines are heavily guarded by millions of years of evolution. So in order for you to actually stop this kind of subconscious worry you have to wholeheartedly believe in the reasoning. If you spend 100 % of your mental energy on performing at your best every day, your future will be the best possible one. And if your future will be the best possible one, there is no need to worry about it. This is just the “permission” that I needed to convince the subconscious mind that it is OK to not worry about everything. To not secretly trying to calculate infinity behind my back (seriously, wth). And the focus is razor sharp. 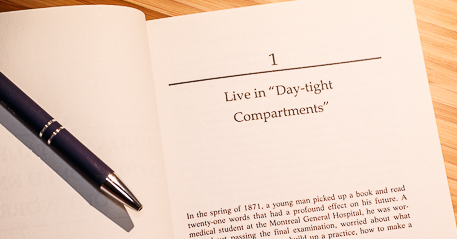 All because of this simple idea of living in “day-tight compartments,” via Dale Carnegie, formulated by Sir William Osler, inspired by Thomas Carlyle. Hope this idea will help you perform at your best as well. And if you have a hard time getting that sense of relief when it is starting to work, try to visualize the big, heavy, watertight iron doors slamming shut between your yesterday and your tomorrow.